The Kiev-born Uliana Alexyuk lights up the international circuit with the beauty of her stage presence as well as the beauty of her lyric coloratura voice, making her debut at Glyndebourne in 2013 as Zerbinetta in Ariadne auf Naxos, and as Gilda in Rigoletto at the Houston Grand Opera in 2014. Uliana graduated from Gliere Music College and entered the National Academy of Music of Ukraine, where she was a student of Professor Eugenia Miroshnichenko. She has won awards in numerous international competitions, including the International Music Competition Queen Sonja, Paris Opera Awards, Young Singers Competition in Lvov, Bella Voce Competition in Moscow and Elena Obraztsova International Competition. Among the operatic roles she has played include Miss Silberklang in Der Schauspieldirektor, Amore in Orfeo ed Euridice by Gluck and Rosina in Il Barbiere di Siviglia by Rossini. From October 2009 to July 2011, Uliana was a member of the Young Artists Program of the Bolshoi Theatre in Moscow, where she studied with Dmitry Vdovin. As a young artist, she participated in master classes with Svetlana Nesterenko, George Darden, Gloria Guida Borrelli, Laura Claycomb, Joan Rodgers, Makvala Kasrashvili, Evgeny Nesterenko, Irina Bogacheva and Luba Orfenova among others. She also had the opportunity to work with conductors such as Antonello Allemandi, Christopher Moulds and Dmitri Jurowsky. She made her debut at the Bolshoi as Erste Dame in Die Zauberflöte in February 2010 and later sang in Brigitta in Tchaikovsky’s Iolantha, Frasquita in Carmen and Marfa in The Tsar’s Bride. In 2010, she went on tour with the Bolshoi Opera in Warsaw (Philharmonie) and Dresden (Semperoper), where she sang in concert Brigitta in Iolantha led by Vassily Sinaisky. The same year, she sang the role of Princesse, Feu and Rossignol in L’Enfant et les Sortilêges of Ravel with conductor Benjamin Pioneer and in 2011 she made her debut as Adele in Die Fledermaus by Strauss. She sang two world premieres. 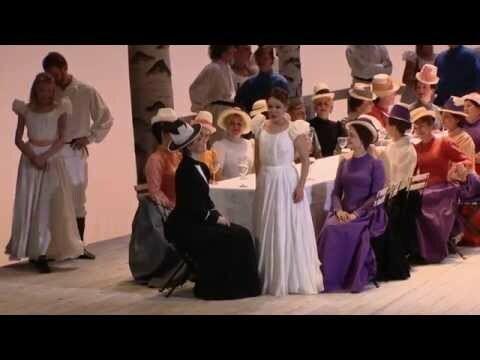 In 2010, the role of Anya in the world premiere of The Cherry Orchard by Philipp Fenelon at the Bolshoi and the St. Petersburg Philharmonic, and later resumed the role in the first staged production at the Paris Opera. In 2011, she sang the central role of Dita in the world premiere of Lo stesso mare di Fabio Vacchi at the Teatro Petruzzelli in Bari. She sang Ludmila in the new production of Ruslan and Ludmila at the Bolshoi directed by Dmitry Chernyakov and conducted by Vladimir Jurowsky, the title role in La Sonnambula at the Bolshoi in a new production Pierluigi Pizzi with the conductor Enrique Mazzola and she made her Glyndebourne debut in the role of Zerbinetta in a new production by Katharina Thoma of Ariadne auf Naxos with Vladimir Jurowsky. In 2013-14, she took part in the prestigious Young Artists Program of the Houston Grand Opera, and sang many roles in this house from 2013 to 2014, including Gilda in Rigoletto, as well as roles in The Passenger, A Little Night Music, Die Fledermaus, and Carmen. She also performed The Passenger with Houston Grand Opera and The Tsar’s bride with the Bolshoi Theater at Lincoln Center in New York. She recently became a member of the ensemble at Badisches Staatstheater Karlsruhe, where she sang the roles of Princess / Fire / Nightingale in L’Enfant et les Sortilêges, the title role of the Nightingale of Stravinsky and Musetta in La Bohème . In the 2015 and 2016 seasons, she sings Giulietta in I Capuleti e I Montecchi, Woglinde in Das Rheingold, Adina in L’Elisir d’amore and Iris in Semele. She returns to Houston Grand Opera in 2017 singing Blondchen in Die Entführung aus dem Serail. In January 2017 She made her House debut as Zerbinetta in Opera am Rhein (Dusseldorf). Her concert repertoire includes Carmina Burana by Carl Orff, Beethoven’s Ninth Symphony in Oslo and the Mozart Requiem in the Great Hall of the Moscow Conservatory. She has worked with such chefs as Enrique Mazzola, Emmanuel Joel-Hornak Vladimir Jurowsky, Patrick Summers, Alberto Veronesi, Tito Ceccherini, Christopher Moulds, Benjamin Pionnier, Vassily Sinaisky, Christopher Mathias Mueller and stage-by-stage Pier Luigi Pizzi, Antony McDonald, George Lavaudant Federico Tiezzi Vladimir Scheblykin and Katharina Thoma.